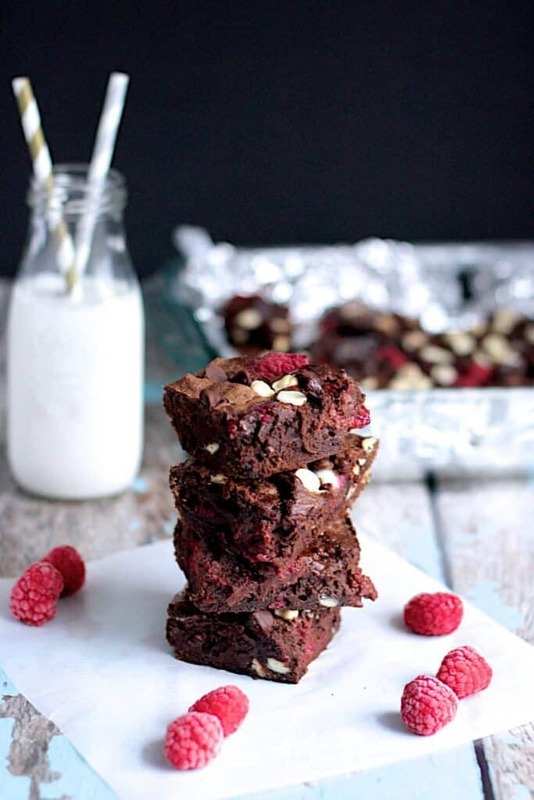 These Chocolate Raspberry Brownies have THREE kinds of chocolate and sweet-tart raspberries. 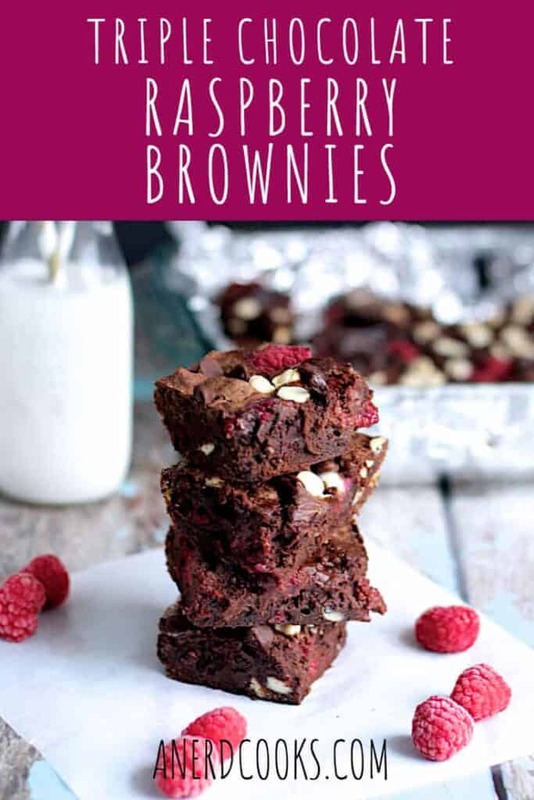 They are the embodiment of sweet decadence in the form of a super fudgy brownie. 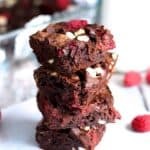 You know, I didn’t realize until just now that I have quite a few recipes for desserts that feature chocolate and raspberries on this blog. First, there came the chocolate raspberry stout cheesecake (trust), then the dark chocolate cupcakes with raspberry buttercream (which I still maintain are the best cupcakes I’ve ever made), and most recently there have been skinny banana raspberry chocolate chip muffins (tasty and pretty healthy!). It’s a delicious flavor combination, that’s for sure. And a small (admittedly irrational) part of me likes to pretend that the addition of fruit to a baked good makes it somewhat healthy. 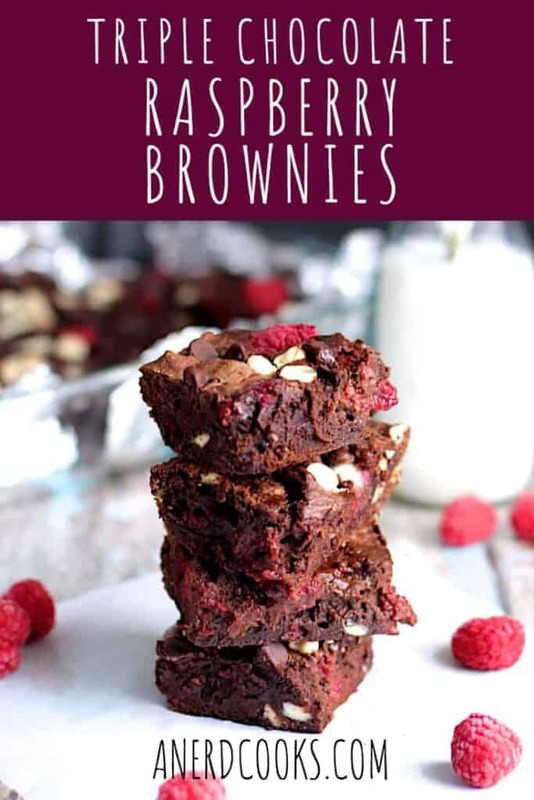 Bottom line: These brownies are fudgy AF. Like, you better eat these with a fork. 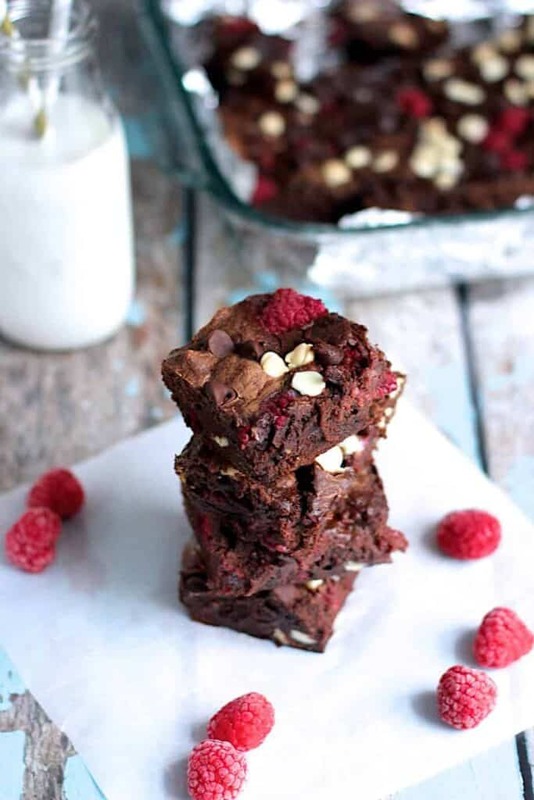 The chocolate chips add some texture, and the raspberries add a pop of sweet and tart flavor. I found this recipe on the blog Clarks Condensed, and couldn’t help but make them ASAP. 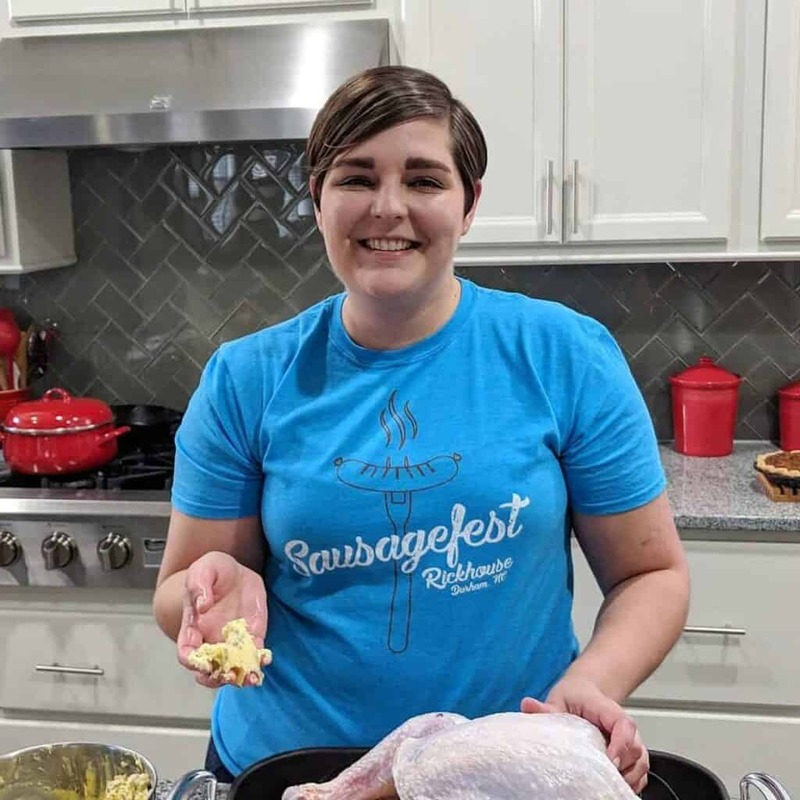 Preheat the oven to 350 degrees F. Line a 9x13-inch baking pan with foil or parchment paper, spray with cooking spray, and set aside. In a medium-sized bowl, whisk together the flour, cocoa powder, and salt. Set aside. In another medium-sized bowl, whisk the melted butter, sugar, and vanilla extract together. Add the eggs, one at a time, whisking until each egg is well combined before adding another. Switch to a spatula, and in a couple of additions, add the dry ingredients to the wet. 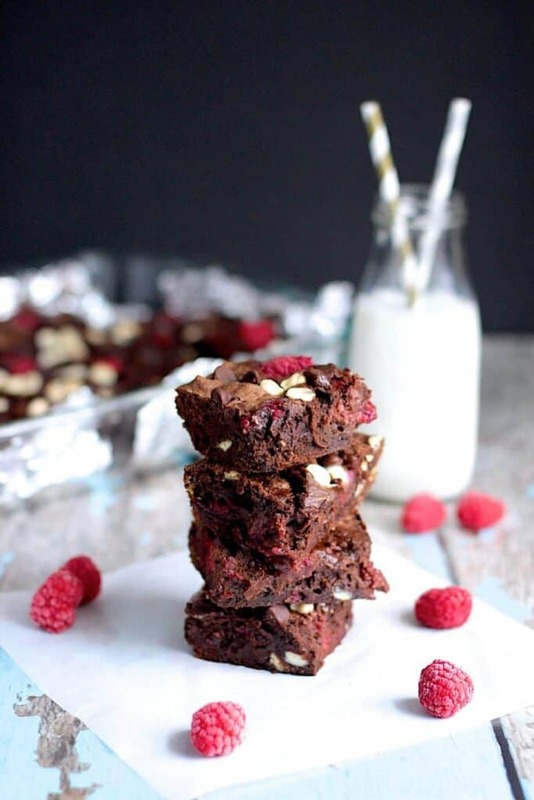 Once things are just combined, add 1 cup of frozen raspberries and 1/2 cup each of both kinds of chocolate chips. Stir until they are well distributed. Spread the brownie batter in an even layer into the bottom of the prepared baking pan. 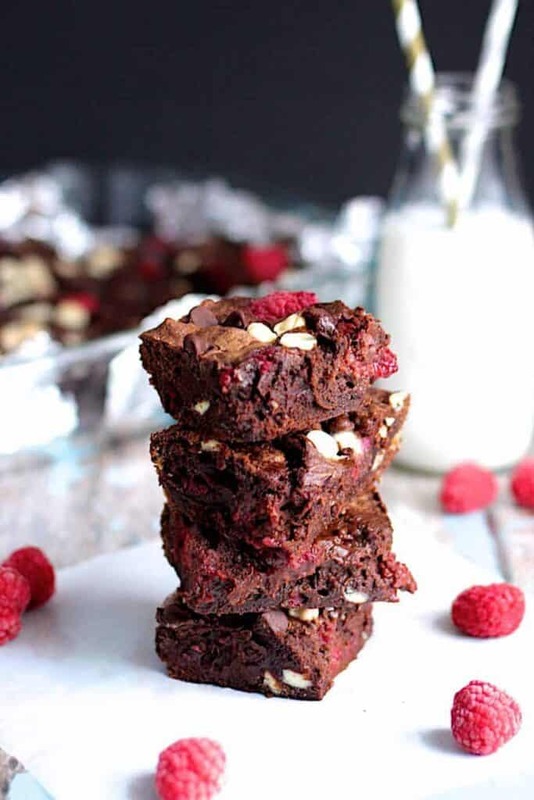 Sprinkle the remaining 1/4 cups of berries and chocolate chips on top. Bake for 28-33 minutes, or until a toothpick, when inserted into the center, comes out clean. Hi Bernie! Thank you!! So, according to http://www.traditionaloven.com/conversions_of_measures/butter_converter.html, 1 stick of butter (8 tablespoons) = 113.4 grams of butter. How long does this brownie keep? Is it good in the fridge for a few days or is it better eaten straight away?